More Accurate and Less Intrusive Device for Geotechnical In Situ Testing - Geocon, Inc. While working on his Ph.D. at the Georgia Institute of Technology in the mid-1990s, Wesley Spang learned of an innovative technology that would change the way he did business. The technology, which was discovered by an Italian geotechnical engineering professor in the 1970s, is called “in situ” (in ground) testing and involves taking ground samples for geotechnical work using a system that is less destructive to soil and can test more accurately. As a geotechnical engineer and president of Geocon Northwest, a geotechnical and environmental consulting firm, Spang said the system is superior to the technique used on 80 to 90 percent of geotechnical sampling projects. Marchetti’s device, called a dilatometer, consists of a wedge-shaped, high-strength stainless steel blade with an expandable membrane, connected to a pneumatic-electrical cable. The blade is pushed into the soil with a cone penetrometer rig, causing significantly less disturbance than conventional soil testing. Nitrogen gas is then introduced through a control box on the surface, flowing through the cables to the dilatometer blade. The control box takes two measurements: the first reading measures the pressure it takes to move the diaphragm off the steel sensing disc, and the second measures the pressure needed to move the diaphragm 1 millimeter into the soil. The device, he said, “causes as little impact on the soil as possible.” Those readings are combined with information about the depth to groundwater to determine soil type, soil stiffness and shear strength. That information can be used for building foundation designs, bridge foundations and highway embankments. Geocon, which has a Beaverton office and is based in San Diego, has used the soil testing device on local projects such as the Oregon Convention Center expansion, the Benson condo tower, Legacy Salmon Creek Hospital and several yet-unbuilt downtown high rises. Seismic upgrade projects include Downtown Self Storage and Kells Irish Restaurant & Pub. 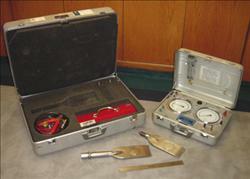 Spang said he has used the dilatometer in other parts of the county, as well. He used it for a multibuilding project in Florida, after another consultant had determined the developer needed to construct several buildings on pilings. Spang’s soil samples determined the buildings could be constructed on traditional footings, not pilings, and saved the developer about $100,000 on each building, he said. In the area of seismic upgrades, Spang said he has done geotechnical projects that show that existing foundation footings can support more loads safely and the seismic retrofit can be done without the expense of expanding the building’s footprint or adding to the footings. The dilatometer blade can take as many as 250 tests in a day. Spang said the dilatometer is particularly accurate when testing soils in the Portland area, which are the silt and clay type. “This area’s soils are very conducive to this testing,” he said.